Having enjoyed the trip into Swildons on the Saturday, we split into 2 groups again on the Sunday. With Chloe leading a party into GB, Brendan, Keith, Mark and myself were booked to go into St. Cuthberts. On the day however, Brendan decided to join Chloe and co. as he had hurt his leg the day before, so only the 3 of us met with Estelle our guide. Estelle pointed out the valve which cuts water flow off from the entrance of the cave, and we descended the shaft to the head of the entrance rift. “There’s lots of hand and footholds, just watch what I do” she said, and then proceeded to slither down the rift faster than the eye could follow! After we had also wriggled down (not as gracefully or speedily) Estelle proceeded to show us around the cave. We regained a little of our dignity (and puff) when we stopped for a quick break and Estelle offered to show us more of the cave than is normally seen on tourist trips, as we were caving so fast!!! Dignity went straight out the window for me however as the first challenge was climbing a vertical water chute which looked impossible from the bottom and I squeaked like a girl. The ‘extra’ tour completed, we arrived back at the entrance series, where I made very heavy work of ‘Wire Rift’, tiring myself out completely before even attempting the tricky final rift upwards. Estelle went first (fairly slowly!) showing me where the holds were, and I wriggled up slowly. At no time did I feel scared of falling, as the rift is so narrow that you only have to bend your knees and you’re not going anywhere. In fact that was the problem near the top – no matter how I wriggled, I wasn’t going anywhere! A final thrust and pull on the arms however and I was up and out, hurray! While Mark and Keith easily followed me up the rift, Estelle and I climbed out of the shaft. 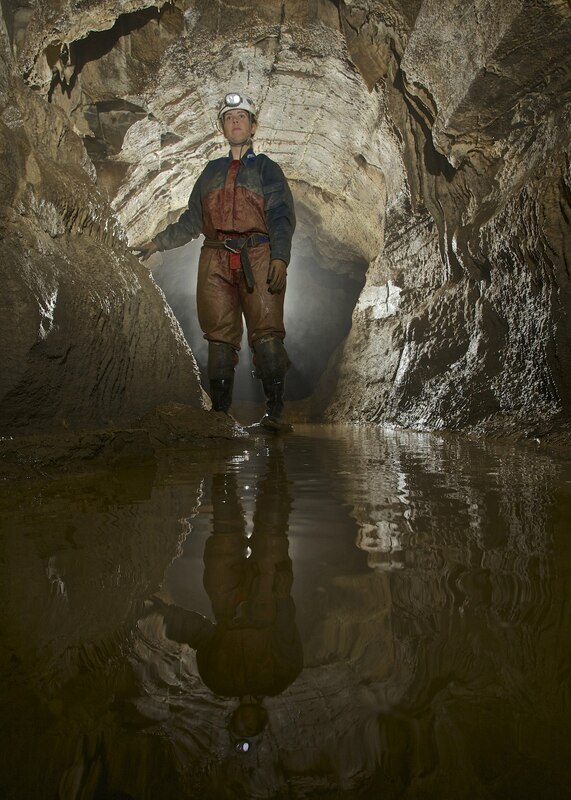 I didn’t quite get to the valve in time to soak the boys unfortunately, but maybe next time – I’d definitely love to go back to this cave and explore it with a little more time. I had been told it was time for me to fly the nest, stop being the baby caver, and lead a trip of my own. So following a request from Becca, we arranged to go into GB. After I had a little last minute studying of the survey, Ian arrived at the Shepton and we headed off to Charterhouse. Once parked and changed, there was a short walk to the cave. From the entrance passage, we took a flat out crawl to enter into Mud Passage. The group popped down two climbs to arrive in The Gorge, where we crossed The Bridge for a little jaunt around White Passage and Rift Chamber. The plan from here was to go down the Oxbow to the Ladder Dig Extension and so I led the group through a crawl on the right. 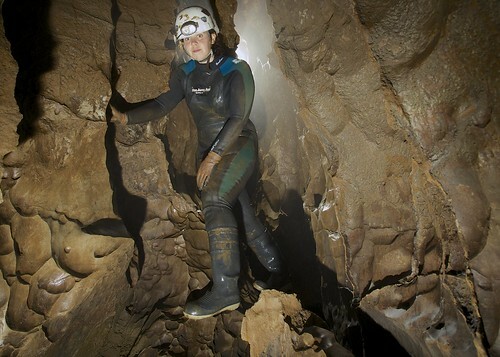 After about 50m of squeezing and contorting ourselves, the passage opened into a 20ft hole which I dropped myself into. When about half way down I realised there were no further hand or foot holds. At about this point, I heard Brendan call from the back of the group that he didn’t remember there being any crawling or a drop in the oxbow, and it soon dawned on us that I was in fact half way down the 20ft ladder pitch heading into Bertie’s Pot. I was going to need some assistance getting back out! So with Brendan gripping my belt, I had to perform a series of belly flops to propel myself back up to the passage floor as graceful as a seal getting out of the sea. After our little navigational mishap, we quickly found the actual Oxbow and Brendan gave a demonstration of how to rig the ladder pitch from the bottom. 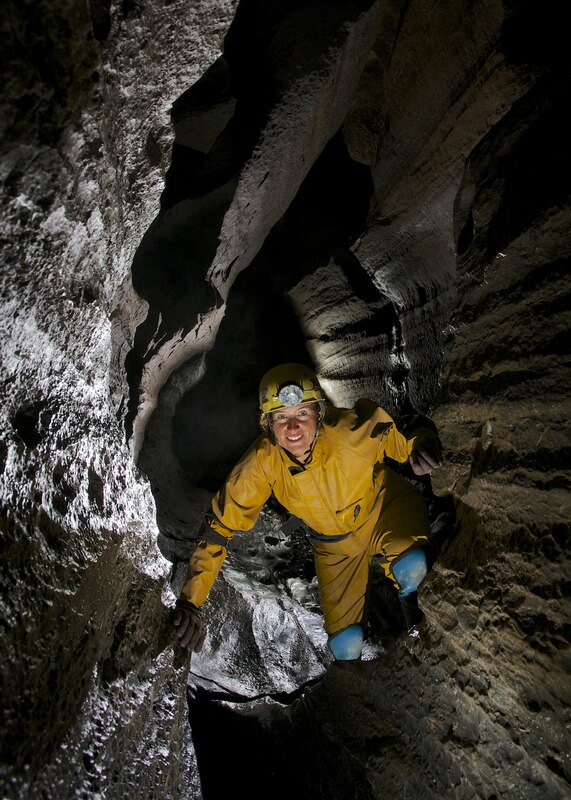 Unfortunately we had run out of time to explore beyond the ladder and headed back straight along the Main Chamber. Before exiting the cave we briefly explored the top end of the Gorge in search of the car. Although we saw various pieces of car shaped metal fragments, we were unable to find the car in the thick slippery mud on the steep slope. It had been a very enjoyable trip with a team that communicated fantastically and with a great feeling of camaraderie. Most importantly I managed to not kill, injure, or lose any of my team! 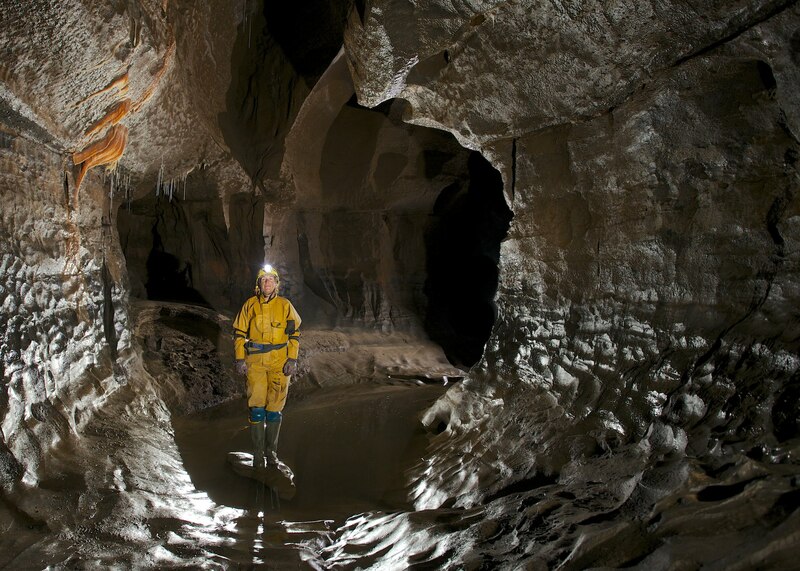 Chloe had been dying to get in to Dan Yr Ogof ever since she’d discovered a love for water in White Scar on our Yorkshire club outing, so when Brendan suggested it as an option for Sunday she jumped at the chance. Jess and I needed one more trip to cement navigation of some of the main routes and so tagged along as model and lighting donkey respectively. Jess took the lead and did a sterling job leading through the lakes, a short stop in to take a look at the impressive Straw chamber before shuffling our way through the Long Crawl. After traversing around the Chrystal Pool we popped up to Flabbergasm Oxbow where Chloe and Jess had a little fun with the slippery slope. On we trekked through the Grand Canyon and Monk Hall before spending some time taking in the beauty of Cloud Chamber. Next up was probably Chloe’s favourite, the Green Canal. Donning a jacket and ring she was soon in her element sploshing along through the canal with us trying to keep up. We took a quick detour to The Rising and paused for a few pictures on the return before making our way down The Abyss and under the Camels Hump. We were soon making our way through the impressively formed Bakerloo Straight, past the Washing Machine and retraced our steps through the long crawl and out. 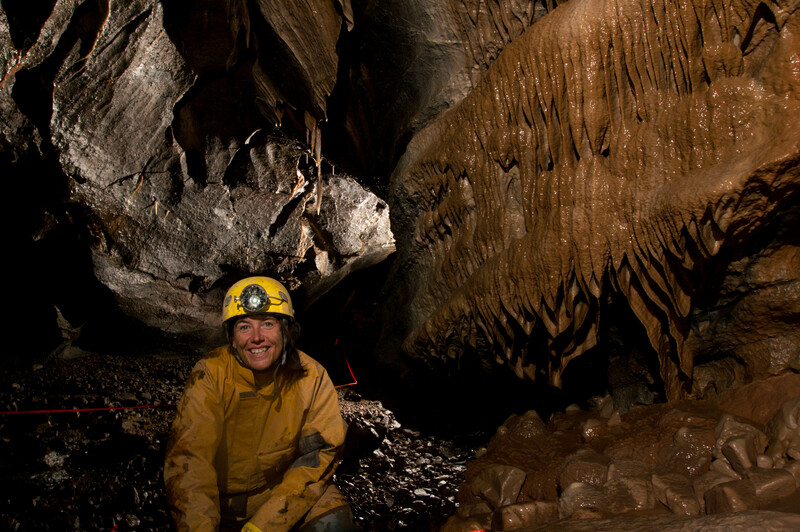 A fantastic cave which Jess managed to navigate without issue and a great way to finish the weekend! After meeting for a quick cuppa in the Co-op, Jess just had time to stock up her supply of cakes and Dairylea Dunkers before we headed off to Herbert’s Quarry. After changing we walked up the hill to an unstable rock face. Brendan indicated a hole at the top and Mark attempted to dive in. He had gone a matter of inches before the puffing, panting and shuffling as the entrance was much tighter than anticipated. After about 30 seconds Mark’s feet disappeared into the crack, to be followed by the sound of falling rocks and a little voice saying ‘it’s quite unstable in here….’. Brendan’s face turned from amusement to a slight look of confusion and guilt as he had no recollection of anyone finding the entrance tight before and upon peering around the rock face a little further, Brendan realised this was not the entrance to Pasg after all and Mark was redirected to the actual Ogof Pasg entrance. Upon entering the cave, we passed through some walking and crawling passages at a reasonable speed until we came to the top of the 10m pitch. Once Mark had been the guinea pig, testing the integrity of the rope that was in-situ, we all followed down and were soon chilling in the canal whilst Brendan took a couple of photo’s. A short time later the U-bend was reached which forms the connection to Ogof Foel Fawr. As the name suggests, this involved a back bending contortion through some water. Beyond this the trip came to a halt at a tight squeeze over a large fallen slab. Rather than getting nervous watching others attempt the squeeze, I decided to push myself forward and go first. Once I had removed my helmet and with a few hands to provide some grip for my feet I slid through far easier than I was expecting. Following my path, Jess popped through with a little assistance, leaving the guys on the far side. Brendan tried posting himself through in several places and gave up quite quickly, whilst Mark pushed himself a few feet into the squeeze before retreating. After proclaiming that he had been through previously and so didn’t need to go again, Brendan found a low by-pass on the right of the squeeze and made his way through with Mark following. Mark tried from the other side to fit and again made it a few feet in before admitting defeat. In true bragging fashion, I volunteered to pass back through the squeeze again for photos, just to make sure I had something with which to remind Mark of my victory. Before too long we had made it to the cave entrance and made our way back down the hillside. Still grinning from my achievements, I proclaimed that it was too early to go back to the club and wanted to do another cave. So under some slight coercion, Brendan led us to Llygad Llwchwr. After Mark and I popped up into the original cave, we climbed down into the entrance of Llygad Llwchwr Two for a little wander around. These few short passages of cave were surprisingly well decorated and deserved to be photographed. After Mark had received a photography tutorial from Brendan, and Jess and I had become rather cold posing for shots, we headed back above ground. Whilst Jess and I changed Brendan wanted to take a look at a dig in the shake hole near the cars and Mark followed him to 'Heavens Gate' after half an hour they both emerged covered from head to toe in thick mud.....apparently there was nothing heavenly about the dig at all! All in all, three short but great little caves! The plan was to complete some video footage of Shakespeare's Cave which was started last year and then to have a look at a couple of other caves in the gorge. After breakfast in Luigi's we headed up to the gorge and parked in the layby. Here we clad ourselves in neoprene, turning the heads of many of the passing motorists. We made our way down through some very dense undergrowth to the River Clydach and then crossed to enter Cwm Pwca and find the entrance to Shakespeare's Cave. A short pause to set up the video gear and then we were heading through the cave. Backwards and forwards through the ducks to ensure that suitable video footage was recorded we made our way through the cave to approach the final sump. 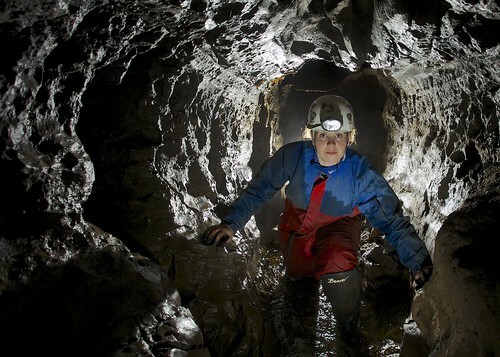 We then headed out the cave, a little quicker than on the way in, with only the mud in Stratford's Bypass causing a delay to our exit as we all slipped backwards trying yo make our way from the Fifth Duck. We headed back to the road and up to the large layby where we dropped down to find the recently refurbished entrance to Ogof Nant Rhin. A cautious entry to the cave was made as we threaded our way through the scaffolded rocks until we were in the solid passage of the cave. We headed first to Aven D'Oznog, splitting up and following the different levels along the phreatic shelves in the tight rift passage that leads to it. Once all there, Keith had to leave and head back to the Midlands. The rest of us then headed to the Garden of Delights and the far reaches of the cave with Mark crawling through the Jaws of Death and staring up into Kerplunk Aven. Our final cave of the day was Ogof Clogwyn we followed the stream down the gorge from Nant Rhin to the point where the stream from Ogof Clogwyn entered the gorge and climbed up from there. The route was quite slippy and very unpleasant. We spent and hour in there and only lost Jess once, before heading back to the cars.